OFC Champions League debutants Nalkutan used home ground to their advantage as an impressive second half performance saw them overcome the favoured Lae City Dwellers 4-1 to claim the top of Group A at Korman Stadium in Vanuatu yesterday. Lae City Dwellers coach Peter Gunemba was unhappy his side wouldn’t be offering their supporters a home match for the quarter final, but said the most important thing was qualifying, which they did. We were supposed to play our best but something went wrong,” he said. “We were thinking we would play better in the second half, even though in the first they raided our defence a few times. I know we can play better but I think they went in and went to sleep. Gunemba said the mind-set switches to the quarter final now and making sure the side is as prepared as possible. Nalkutan coach Moise Poida praise his side for the outstanding performance and said executing was near perfect. The top two teams in Group A, the fans who trickled into Korman Stadium knew they would be in for a tight match, and for the first 45 minutes they were. Both sides had chances, although the home side appeared to enjoy much more possession, and were inseparable going into the break. 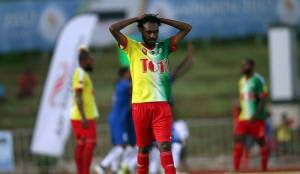 However Nalkutan came out of the sheds much more prepared for the second half and almost caught Lae sleeping as Azariah Soromon netted just two minutes after the restart. A second came in the 58th minute followed a minute later by substitute Richard Manuriki’s well placed strike. Lae City Dwellers answered back through Nigel Dabinyaba who latched onto a great pass before chipping it into the net. Soromon rounded out his hat-trick and put the game to bed in the 90th minute to send the crowd into frenzy. After a fairly even first half where both sides enjoyed chances in a high-pace, test of strength and stamina, Poida said the instructions at the break were clear. “We analysed the first half and changed a bit the way we played. We had to take them behind the back so the combinations in the final third were really important. Nalkutan will now host a home quarter-final while Lae City Dwellers will await the official draw on 5 March to learn where they will be heading next in the OFC Champions League 2018.